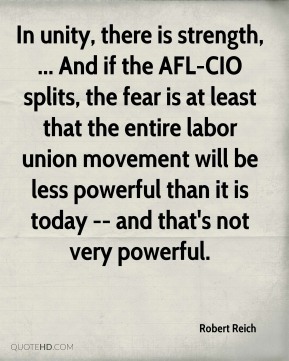 In unity, there is strength, ... And if the AFL-CIO splits, the fear is at least that the entire labor union movement will be less powerful than it is today -- and that's not very powerful. 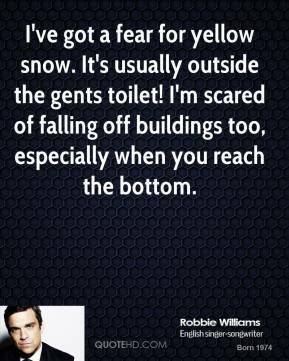 I've got a fear for yellow snow. It's usually outside the gents toilet! I'm scared of falling off buildings too, especially when you reach the bottom. What it is, is hitting shots without fear. We all have fear in us, fear of pulling it left in the water or pushing it right in the trees. But when you're confident, it doesn't matter if the whole green is surrounded by water because you are not thinking about that. All you are thinking is putting the ball as close as you can to the flag. 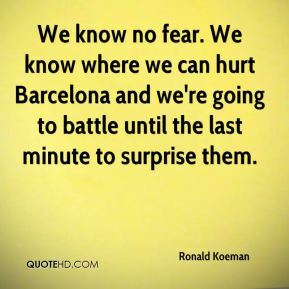 That's confidence. I didn't know what I saw -- swamp gas, space ship, sundog, weather balloon. What impressed me was my parents' fear of reporting the sighting. 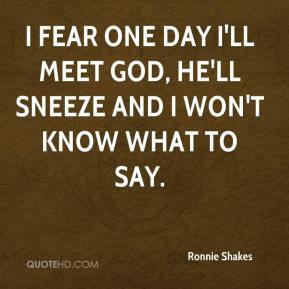 I realized that even in our allegedly rational age many things remain unspeakable -- damned, blasphemous. 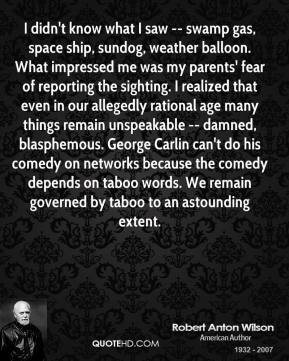 George Carlin can't do his comedy on networks because the comedy depends on taboo words. We remain governed by taboo to an astounding extent. 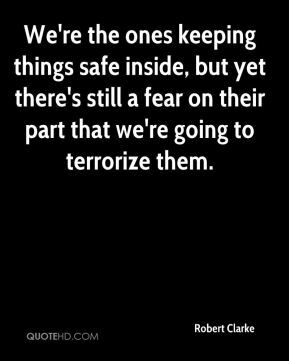 We're the ones keeping things safe inside, but yet there's still a fear on their part that we're going to terrorize them. 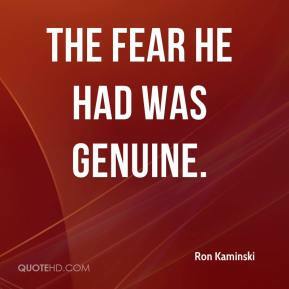 The fear he had was genuine. 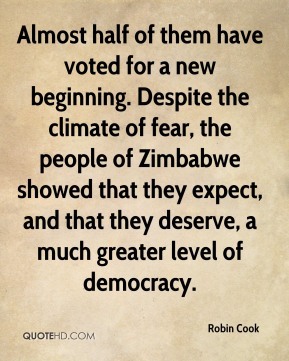 While this certainly sounds dramatic, we fear it may not be enough. 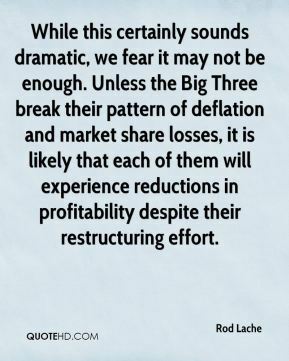 Unless the Big Three break their pattern of deflation and market share losses, it is likely that each of them will experience reductions in profitability despite their restructuring effort. When things aren't going well, you have to bring youth in because the youngsters have a complete lack of fear. They don't worry about failure and they only think of the good things that can happen. They have eliminated their genetic diversity. 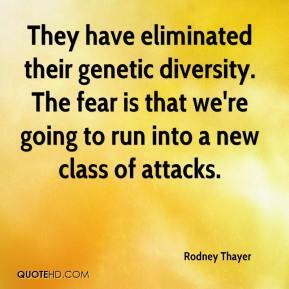 The fear is that we're going to run into a new class of attacks. 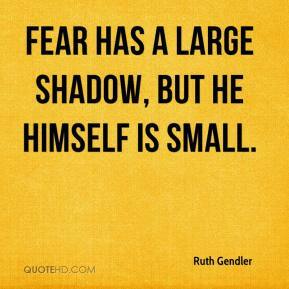 The problem is, we fear negative consequences a lot more than we value positive ones. 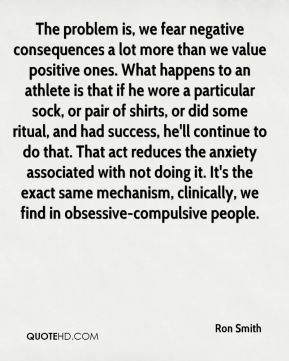 What happens to an athlete is that if he wore a particular sock, or pair of shirts, or did some ritual, and had success, he'll continue to do that. That act reduces the anxiety associated with not doing it. It's the exact same mechanism, clinically, we find in obsessive-compulsive people. 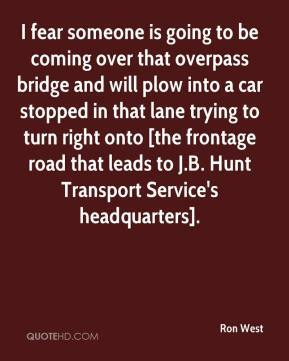 I fear someone is going to be coming over that overpass bridge and will plow into a car stopped in that lane trying to turn right onto [the frontage road that leads to J.B. Hunt Transport Service's headquarters]. 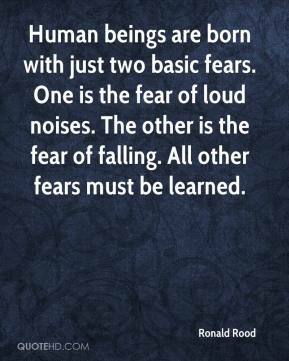 Human beings are born with just two basic fears. 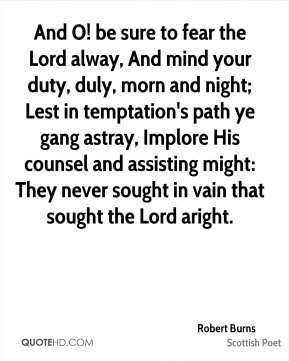 One is the fear of loud noises. 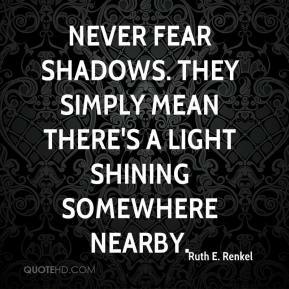 The other is the fear of falling. All other fears must be learned. 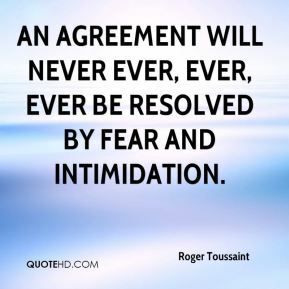 An agreement will never ever, ever, ever be resolved by fear and intimidation. 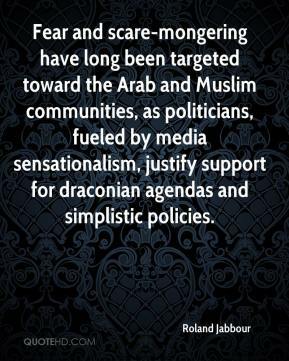 Fear and scare-mongering have long been targeted toward the Arab and Muslim communities, as politicians, fueled by media sensationalism, justify support for draconian agendas and simplistic policies. 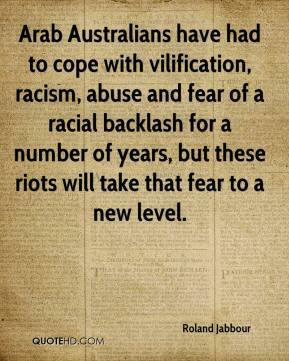 Arab Australians have had to cope with vilification, racism, abuse and fear of a racial backlash for a number of years, but these riots will take that fear to a new level. 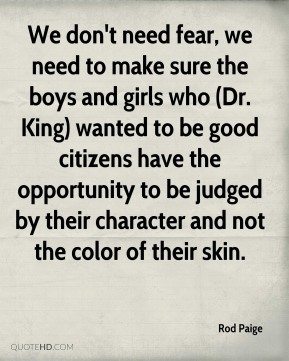 We don't need fear, we need to make sure the boys and girls who (Dr. King) wanted to be good citizens have the opportunity to be judged by their character and not the color of their skin. 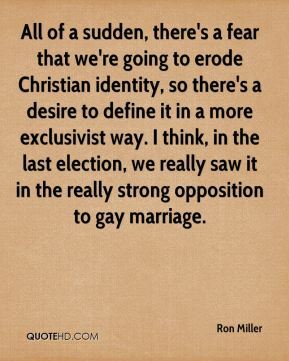 All of a sudden, there's a fear that we're going to erode Christian identity, so there's a desire to define it in a more exclusivist way. I think, in the last election, we really saw it in the really strong opposition to gay marriage. He rules the country by fear and you can see the Government here wanting to do the same thing, but what's the point? History has dictated you can have all the security measures in the world with all these people taking their shoes off and dropping their nail files into boxes before they get on to a plane and, guess what, the terrorist will be on the train. You can't make people be afraid all the time. It is no way to live your life and no way to govern a country. For fear of upsetting China, the US cannot face up to the existence of a democratic Taiwan. 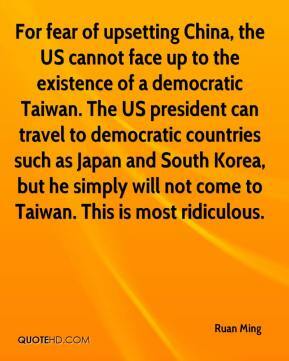 The US president can travel to democratic countries such as Japan and South Korea, but he simply will not come to Taiwan. This is most ridiculous.